Alision, Courtney. Carr, Tina. Laskow, Caroline. Peacock, Julie. The Soup Club Cookbook. USA: Clarkson Potter / Publishers. 2015. What a novel idea! With explanations of each step, soup recipes complete with condiments, and pictures galore, each author shares ingredients, personal notes, directions and variations. 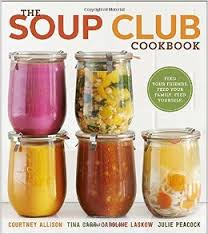 Perfect for friends or neighbors living close-by, The Soup Club Cookbook may be the answer to what’s for dinner. Though not necessarily in a place to start a Soup Club at the moment, I certainly did appreciate the recipes as well as the well-planned and explained concept. Definitely an idea that could revolutionize dinner, the cookbook will remain on my shelf and be used often for fresh soup ideas. Soup’s On! Giramonti, Lisa Borgnes. Terestchenko, Ivan. Novel Interiors: Living In Enchanted Rooms Inspired By Literature. USA: Potter Style Publishing. 2014. 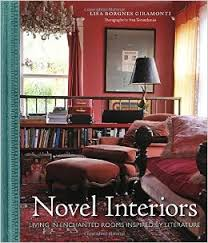 Novel Interiors follows the inspiration that we don’t just read a great story, we inhabit it. With gusto and flair, Lisa Borgnes Giramonti enters the enchanting world of more than sixty literary classics to show how novels can influence a decorating style. From homey to eccentric, from Jane Austen to F. Scott Fitzgerald, many textures, colors, quirks, quotes and pieces make up each living area. Accompanied by stunning photography, this book definitely has some novel ideas. I love books including home decorating books. (There always seems to be a few tidbits and ideas I pick up to try in my own home.) Novel Interiors was full of new ideas and visually pleasing photographs. Many of the style ideas were inspired by classical books; however, some were not as connected to the theme. While I did enjoy the book for the decorating designs and architecture of the houses/ rooms, I am not sure the book followed the original intentions closely enough. The title of the book was perfect though and hit the target exactly.